Curacao as an island that is home to a diverse population of people who speak a diverse number of languages. 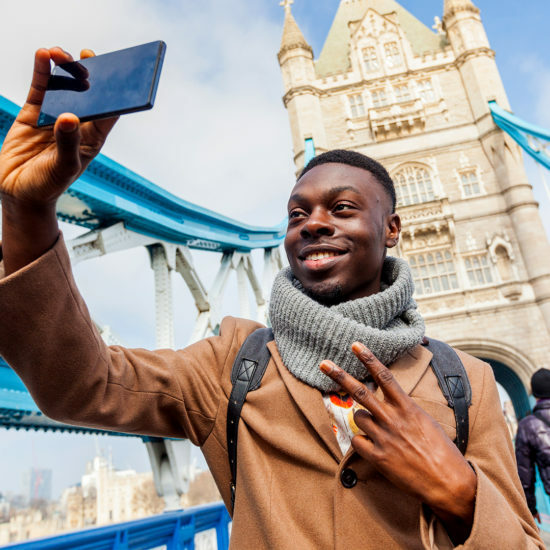 As a part of the Lesser Netherland Antilles, residents of the island not only speak Dutch, but Portuguese as well as Papiamento and local creole language that derived from African and Portuguese languages. Even with that in mind, tourism is a major source of income for the island. Although it is less reliant on it than many other Caribbean islands making this a destination that welcomes some 1.7 million guest to their sandy beaches in 2015; it is still an island that has more to offer than the standard tourism hallmarks. From Curacao Carnival to the Foam Party or Full Moon Party at Kokomo Beach there is something for everyone to take part in. It all comes together during Curacao Pride to make an exciting and amazing event for all to take part in. Both Curacao Pride and Pink Curacao do an amazing job ensuring that there is a little something for everyone to take advantage of during the festivities. Not necessarily a Gay Bear Directed event, it well Inclusive and being in a region with few LGBTQ event options, it’s worth highlighting for that and their beaches, ocean and weather alone. 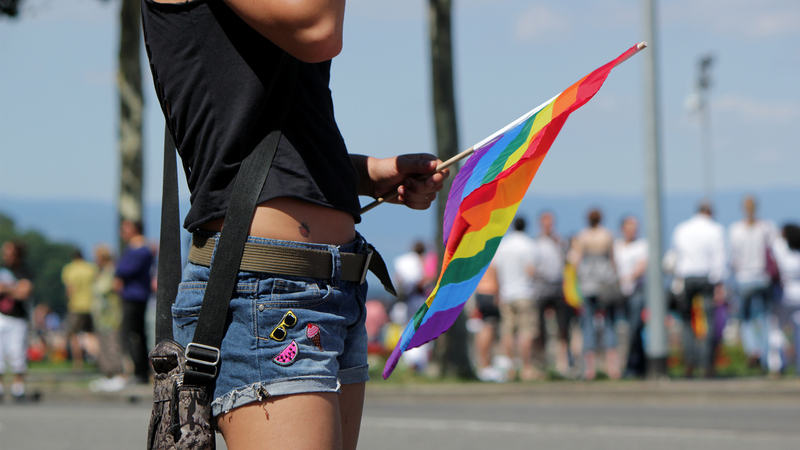 Pride Walk and Opening Concert: Unlike the Pride Parade that happens with most other LGBT Pride events, Curacao Pride has a distinctly Caribbean feel to it. From the fact that it is the Opening Event, which includes a Drum Line as well as a major difference between your Pride event and this one. 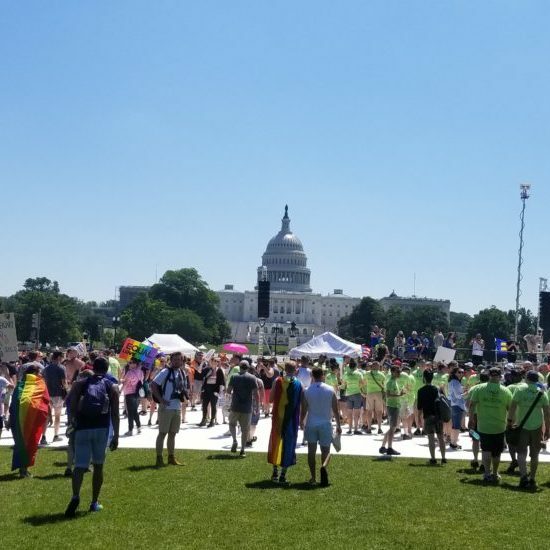 We all get to participate in the Pride Walk, not just sit as the entire event passes us by. We walked through the streets of Willemstad from Rif Fort to Wilheminaplein with the Steel Drums and Pride Flag ahead of us leading the way over the Queen Emma Bridge. Once in Wilheminaplein, we partied the night away. With music from MC Divine, DJ RO1 and DJ Maarten Schakel along with Shary-An Nivillac and her Amsterdam Pride anthem I Am What I Am. Rainbow Lounge XL Pride Edition: By Friday, we all are in the swing of Pride Weekend. The Lobby of the Floris Suite Hotel is transformed into a Nightclub. The Front Desk becomes a Bar, the Seating Area becomes a Dancefloor and everyone invited Dances the night away turning this fully functional hotel into a whole new entity. Our Hostess, ensured that we remained informed of the events coming up, Tiffany T Fantasia, all while entertaining us alongside the DJ’s who got us pumped up and the performances by Axl and Friends that kept us and the festivities going. We started early at 6pm and went until well after Midnight, and from Despacito to Hotter than Hell the music remained upbeat and kept the dance floor or what used to be the lobby of our hotel packed. NaviGAYtion Sea Parade: For many of us, Saturday was a long day. 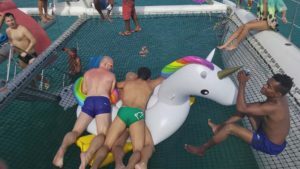 Starting at Noon, we boarded the Black and White operated by Blue Finn Charters, each of us handed a Rainbow Pride Flag that we waved incessantly as we passed resort after resort on the sea. The Black and White is a 75 foot Catamaran that traversed the water quickly. All while the weather remained as amazing as ever for Curacao and the crew was attentive to the needs of us on boar. After leaving Handelskade Punda we set sail down the coast to Fuik Bay. Fuik Bay is a calm Oasis further south that many of us ventured while we visited island. The water was so blue and calm it had me considering diving in and enjoying the waves, even as weak of a swimmer as I am. White Party: Once we returned from our Sea-faring adventure we rested and relaxed as best as we could before heading to the White Party. An event that once again took place right in the Hotel itself, we took over the Pool and Deck area of the Floris Suite Hotel and all attempted to dress up in our fanciest attire in “White” to both entertain ourselves and of course win the prize for best dressed. 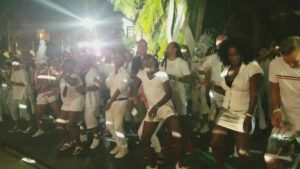 For me in particular the White Party is the pinnacle of the events for Curacao Pride. 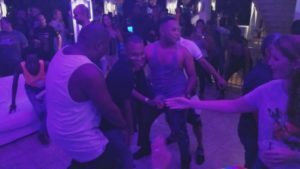 A dance party, outdoor concert and on a night when most guests on Curacao whether apart of the LGBTQ community or not can take the time to enjoy the sounds and each other along with the amazing weather, which allows you to party the night away in shorts and a tank top if you so desire. The Party lasted from 8pm to a whopping 4am making it one of the longer events of pride as well. Closing Night Beach Party: One difference between the years of Curacao Pride is when the Beach Party occurs. It is important to know that there is no way one goes to a Caribbean Island with over 40 beaches available and does not expect an event to host a Beach Party. 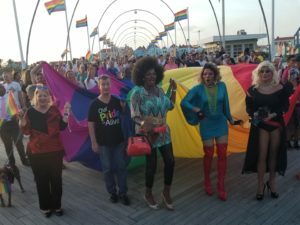 Last year the Beach Party happened on Wednesday, this year it was the last day of Pride. Which after the long day of lounging on the boat deck and even longer night at the White Party, a relaxed Beach Party was a great way to end the 4 day event. Taking place at Moomba Beach, a private beach that guests of the Floris Suite Hotel has access relax and sunbathe at. On Sunday, the Beach house at Moomba Beach converted into a stage, as Tiffany T Fanatasia, showed us that It’s Not, But It’s Okay that Pride was coming to an end. Especially since there was a slightly more liberal pour at Bar during the event. Sadly, Curacao did see a small change that impacted those of us who had experienced a trip to the Island before. The Gallery Lounge which was a small LGBT Bar, closed this past August. So if you were looking for an after hour destination after the Opening Concert or the Rainbow Lounge this was no more. Many other aspects of Curacao remained as idyllic as they had been for us returning visitors. The beaches remain as enticing as ever. Pink Curacao planned many tours for those of use who took advantage of them. We took a tour of the Island where we saw Boka Tabla, which is a cave that has been created in the limestone by the ocean waves. And of course there are many tour providers that you can book outside of both Pink Curacao and Curacao Pride, that will take you to places such as the Kristoffel National Park or to the aquarium on the islands.